It’s easy to get lost when looking for places to stay in Seminyak for your next Bali holiday. Seminyak is the center of Bali’s vibrant scene. It’s often dubbed as a more “mature” neighborhood compared to Kuta. And Seminyak does offer a wealth of stunning accommodations for a unique stay experience. Here are some ideas! 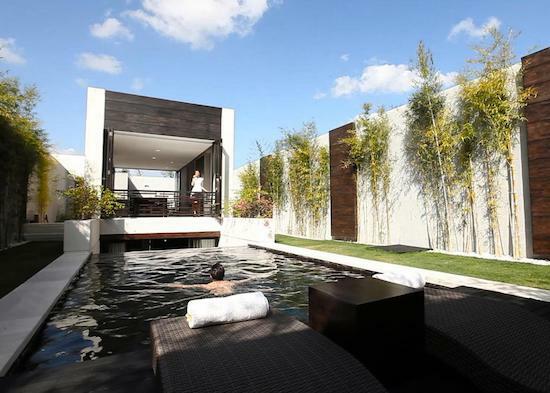 The TS Suites Leisure combines modern architecture and tasteful styles. 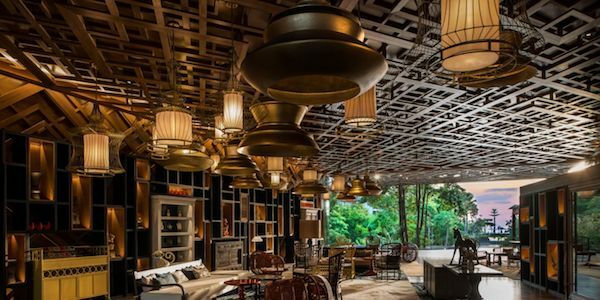 The feel of the style is arguably different from most hotels you can find in Bali. The stone-textured wall in the bedroom gives a touch of dimension to the overall modern design. If the weather is clear (and it usually is in Bali! ), you’ll be able to see the silhouette of Mount Agung as you enjoy swimming on the rooftop pool. “A state of intellectual, physical, and emotional balance” is what the eqUILIBRIA Hotels claimed to uphold. It’s been cited as one of the hotels with value for money. Equilibria is one of the hotels with a “green” mindset for those who are concerned with green living. According to their website, their decors are made out of recycled materials. Price range: Starts from $200s per night and it goes up in high seasons. The Katamama hotel is another place to stay in Seminyak with its own delightful concept. Bringing forth the Indonesian arts and culture at its finest. It’s a hotel that will make you feel like you’re surrounded by artists’ works. The place is truly where you can find a perfect blend between the Indonesian culture with modern living. Check out their instagram feed at @katamama_hotel that shows you nothing but pleasant aesthetics. Price range: Starts from $280 for 2 persons per night. Location: Jalan Pettenget No.51B Kerobokan Kelod, Seminyak. The Katamama hotel is only 9 minutes walk away from Pura Petitenget, a tranquil temple that represents a cultural landmark of the Seminyak area. And Sunset Road, the main road hub of Seminyak can be reached in 5 to 10 minutes depending on your mode of transportation. It’s one of the most prime locations when it comes to places to stay in Seminyak. Abaca villas are villa complex that offers the tranquil combined with Balinese traditional decor elements. The villas are located at the center of the busy Seminyak. However, it was conveniently tucked away that provides you with your much-needed privacy. With private butler services, your holiday is going to be the most luxurious experience. Price range: Starts from $7,000 ask for rates inquiry at the website. 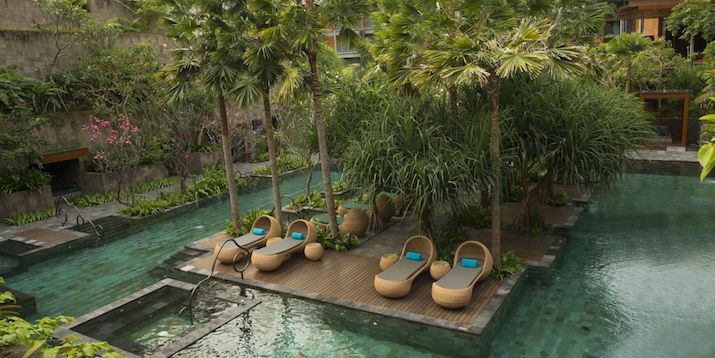 The WET® Pool is modeled after the rice terraces in Bali. The rooms are a representative blend of modern and luxury. They have the WOW suites that reflect their ultra-modern vibes, the WOW villas, as well as the Ocean Facing Retreat and Garden View suites. So, appreciate the fun architectures that you’re going to be surrounded with! 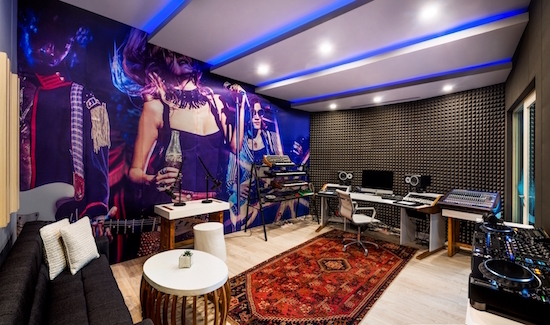 The hotel offers a unique experience for those who would want to experience professional audio recording. The W Sound Suite has been dubbed as one of the freshest concept in a hospitality industry—a hybrid with the entertainment field. And you can experience this as you vacationed in none other than Seminyak, Bali. It’s one of the best places to stay in Seminyak—if not the best—for musicians. W’s brand ambassador, Ingham, said that the W Sound Suites are the perfect environment that enables you to be creative even in the dead of the night. Therefore, this is the place to be creative. Create your own records as the inspiring Bali scenes strike you! Price range: Rooms start from $200 to $700 depending on your room of choice and whether it’s high or low season. Location: Jalan Petitenget, Kerobokan, Seminyak. The hotel is located within the walking distance of… everything! The best of all is the beach. You can also find numerous cafes, restaurants, and beach clubs all reachable through walking. Located at one of the most prime locations of Seminyak, Hotel Indigo Seminyak is a solid place to chose from if the location is one of your concerns. And most importantly, despite housing almost 270 rooms more or less, Hotel Indigo Seminyak feels like an exclusive accommodation in itself. Location: Jalan Camplung Tanduk No.10 Seminyak. Hotel Indigo is only 5 minutes walk to the Mesari Beach and numerous other beach clubs such as La Plancha. One of the main roads, Jalan Raya Seminyak is only 10 minutes walk away. Visit their website at www.ihg.com. Although the architecture is something you’ll find at a lot of villas and resorts in Bali, Villa Air Boutique Resort and Spa is one of the most tranquil places you can find in Seminyak. Enjoy garden restaurants and serene, private villa complexes. 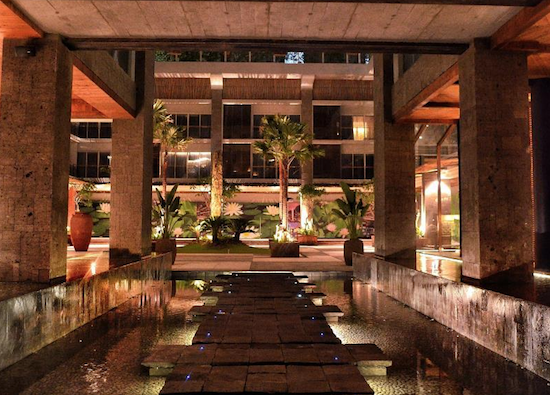 It’s a hidden space amidst the busy Seminyak neighborhood. Price: Starts from $180 – $500 per night depending on the size of the villa. Location: Jalan Lebak Sari, Banjar Taman, Petitenget, Kuta Utara. Villa Air Bali is less than 5 minutes drive away from Pura Petitenget by scooter and 15 – 20 minutes away by walking. 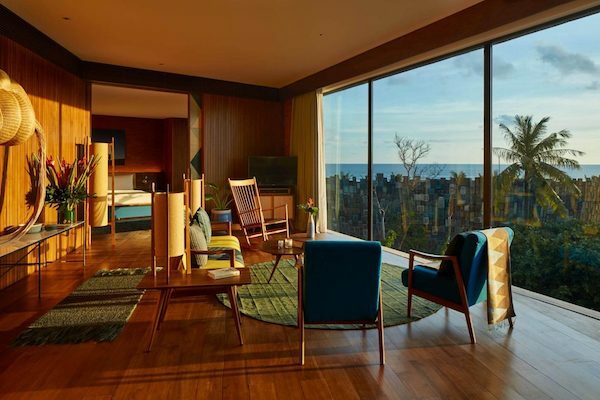 One Eleven Bali is the resort that takes the open-space concept to heart. You’ll find yourself gaping at the size of the villa compound as well as the architecture. The architecture maximizes outdoor light to come into your indoor space. 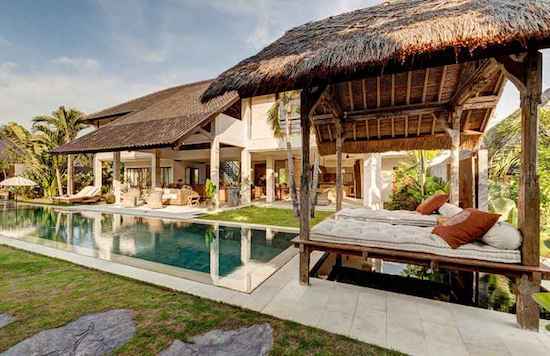 The concept of the villa complex itself is reminiscent of Balinese family houses with laid-out compounds. 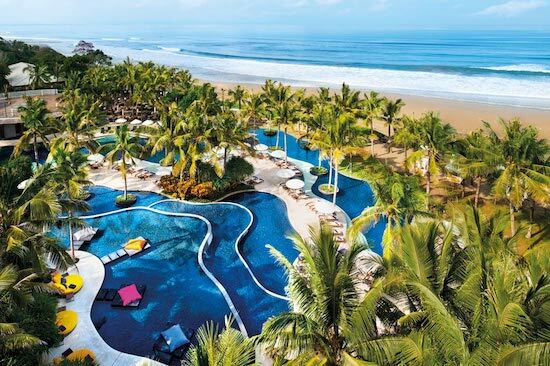 One Eleven Bali Resort won The Luxury Travel Guide Awards as the Luxury Adult-Only Resort of the Year in 2018. Price: Starts from $261 for 2 guests to $415 per night for up to 6 guests. Location: Jalan Pangkung Sari No.3 Kerobokan, Seminyak. Find out more on their website One Eleven Bali.